Commander Battle is a brand new strategy game for mobile devices by mobirix. Check out our Commander Battle guide, tips, cheats & strategy to win battles like a pro! Mobirix, the creators of World Zombie Contest, Hero Defense King games recently released a brand new strategy game Commander Battle for mobile devices. The game features lots of game modes such as campaign, challenge, PvP, and Rank mode. Additionally, lots of aircraft, army units, tanks, jeeps like combat units are featured. In this post, we have covered everything about the game you need to know; Commander Battle guide and Commander Battle tips, cheats & strategy guide. Before we move to the cheats, tips & strategy guide part, let’s learn the basic of the game. In Commander Battle, your objective is to protect your own base and destroy the enemy base. Just deploy the combat units by tapping on the cards, at the bottom of the screen. There are lots of combat units featured in Commander Battle game and you should deploy these units in the battle in a strategic way. 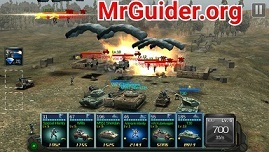 Read the cheats, tips & strategy guide below to master the battle. In PvP mode, you battle against other players from all over the world and earn medals. Obtain medals, rank-up, and earn more rewards. After a certain level, challenge mode & rank-mode gets unlocked. Play these modes and earn better rewards. As you progress, the difficulty level will increase and it would be hard to get victories in the battles. To get victories in these hard stages, you have to upgrade the combat units. So, this is the basic guide. 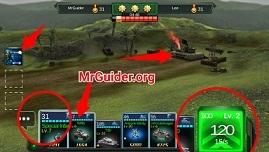 Now, let’s begin Commander Battle guide and after it, check out Commander Battle cheats, tips & strategy. In this part, we will learn about the combat units, upgrading, star-upgrade, leveling-up, promoting, how to unlock or get new combat units, modes, and much more. You can check all the units you have – Go to the main screen -> inventory. Tap the unit to check the grade. You can choose up to 6 units for the battle. To remove or add a unit to your team -> go to the home screen -> tap the army option -> deploy unit -> tap a unit to remove or add. Read the cheats, tips & strategy guide below to learn how to choose units wisely. To increase the attributes(damage power, HP, defense, speed) of a combat unit, level-up it. Leveling up costs you coins and COM. COM and coins can be obtained by getting victories in the campaign mode stages. To level-up a unit, go to the inventory -> tap the unit -> at the bottom-right corner, tap the level up option. You can raise the star level of a unit once you reach its maximum level. For example; you have a combat unit(2-star) and its maximum level is 40. Reach the maximum level and then you can upgrade it. Upgrading will raise its star level(from a 2-star unit to 3-star unit) and the stats. It costs you coins and stars. Stars can be obtained by getting victories in the PvP battles. As you know, B-grade and A-Grade units are more powerful than C-Grade and D-Grade units. Getting a B-grade and A-grade unit is not an easy task. But you can promote a unit and raise its grade. For instance, you have a C-grade unit. To transform it into a B-grade unit, you can promote it. Promoting costs you coins, honor card, and duplicate units. Honor card can be obtained by getting victories in the PvP battles and by retrieving a unit. As you know, to promote a specific unit, you need duplicate units. For example, Anti-Tank is a combat unit and to promote it, I need two duplicate Anti-Tank units. You can open the supply shop using silver keys(as a reward) and after every 24-hours[free] or using diamonds. But to open premium supply shop, diamonds are required. Go to the home screen -> army -> deploy units -> go to the last tab(skill) -> choose skills. In the battle, your objective is to destroy the enemy base as fast as possible. At the bottom of the screen, tap on the combat cards to deploy a specific unit. It costs you energy. Energy re-generates automatically. You can check the energy cost at the top-left corner of a unit’s icon. To produce energy fast, you can upgrade the energy generator. It costs you energy. To upgrade, tap the energy generator when it turns green(take a look at above picture). Upgrading it increases the speed of energy production and you will be able to deploy high-cost units fast. So, this is the Commander Battle guide for the beginners. Now, let’s start the Commander Battle tips, cheats & strategy guide. The very first tip; don’t develop all the units. You may have dozens of units in the inventory. But you can not upgrade all the units as it costs you coins and COM(limited). That’s why you should focus on the best units. If you spend coins and COM on useless combat units, it would be waste. Now, the question is which are your best units. Go to the inventory -> check each units’ attribute; HP, damage power, attack speed. Compare the units with each other and select the best ones. 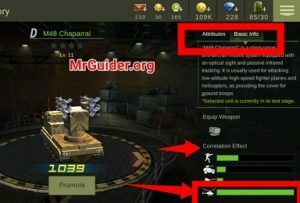 Read the second tip to get detailed information; how to select the best units. It is one of the important tasks in Commander Battle game. You should add units to the team on the basis of co-relation effect. To deal more damage to a specific unit. For example; You can easily destroy tank type units in the battle by deploying anti-tank units. In Commander Battle game, each unit has special correlation effect(or each unit is better against a particular type unit). Go to the inventory -> tap a unit -> go to the basic info tab -> check its correlation effect(better against Jeep or Infantry or Tank or Helicopter). Anti-Tank is a unit that can easily destroy a tank type unit; it’s because of correlation effect. In short, select a specific unit to target a particular unit(i.e. Anti-Tank unit to destroy tanks).